Teeth bared, legs stiff, a challenging stare. An aggressive dog is a menacing thing to behold and touches on deep seated fears in many of us. Every year there are reports of dog bites and attacks in the newspaper, often resulting in the tragic deaths of children. So what can be done to avoid this danger? Increases in dog attacks in the late 80’s and early 90’s led to the hasty issue of the 1991 Dangerous Dogs Act, which bans the breeding, sale and exchange of 4 kinds of dog. These are Japanese Tosas, Dogo Argentinos, Fila Brasileiros and ‘pit bull terrier’ type breeds. The Dangerous Dogs Act also covers dogs that are crossbreeds of these types of dog. Unfortunately, the act was not well worded and limits the ability of the police to deal with a dog suspected to be aggressive and only deals with dog aggression in public places, leading to numerous complaints about its ineffectuality. In 1997 the law was revised but was still considered lacking and in March 2007, the Animal Welfare Act will be issued which includes codes of practice for dog keeping. This is a very important focus. Though it’s true that dogs like the pit bull that are bred to fight other dogs have a higher pain tolerance and are naturally more aggressive, the cause of dog attacks are more frequently due to poor breeding practices, hazardous methods of guard dog training and lack of knowledge by owners on how to deal with canine dominance issues. While the breed of a dog has relevance to its propensity for aggression, the way it is raised has even greater impact. Many owners create a dangerous animal because of the ‘tough’ element of having a guard dog which responds only to them, using abusive methods of training that result in hostility to strangers and other animals. The Animal Welfare Act may help put a stop to this practice. Possessiveness towards a certain area or piece of furniture, refusal to leave that spot that includes growling, barking and showing of teeth. If your family pet is showing any of these signs, a professional trainer needs to be brought into the picture. If the trainer can not re-channel the aggressive behaviour of your dog, it will need to be removed from your home for the safety of your kids. Teaching your kids how to deal with an aggressive dog is one of best ways to keep them safe, so go over these tips with them. A child should never approach a strange dog without adult supervision, especially when that dog is eating or sleeping. Running away from an aggressive dog also provokes an attack, as does screaming so children should stay calm and try to tell the dog to sit, stay or go home in a commanding voice. This can snap a dog out of aggressive mode if done convincingly. Making eye contact can be interpreted as a challenge so a child should never try and stare a dog down. A child should never try and break up a dog fight and as awful as this may sound, parents need to tell their children not to try and save their pet if another dog attacks. Many children have been savagely mauled and bitten by picking up the family pet when a strange dog has become aggressive. If the dog begins to attack, children should protect their neck and face with their arms, keeping their fingers curled up into fists. If possible, the child should stay in a tight ball. Staying calm in the face of a dangerous dog situation and having knowledge on how to deal with strange dogs might end up saving your child one day. Dog bites are serious matters and should never be dismissed lightly, so don’t hesitate to take measures to protect your child from dog aggression. The rules for not allowing certain animals in the country is stupid, for an animal to be aggresive is just its natural nature sometimes it wants to be just layed back but sometimes it just wants to fight, it's just what animals do. So who are we to ban animals in this country. we are animals aswell and we're worse than animals we shoot, fight, stad, blow people up so do we have to banned too? no! because the goverment think they're over everything. Last time i checked animals was on this earth before us, we're just just an animal wondering around thinking we own the palce! My opinion on animals getting banned is just bloody stupid and pathetic and we should allow any anamal in this god dam stupid country! 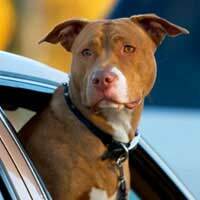 Not all pit bulls are aggresive its the way they are trained so therefore its down to the owner. I have a pit bull in america and cant have it in england coz of people believing they are naturally aggersive and they are really one of the most loving and adoring dogs if brought up right!!!! I think this website is very useful being as I am only 12 and the tips on dog attacks are very useful thank-you Pets and Kids you are very use-ful I will pass this website onto all my friends and family members.